Jack Eichel was named captain of the Buffalo Sabres on Wednesday. Drafted by the team in 2015, this is Eichel's fourth season with the Sabres. He has led the team in points over the last two seasons. 64 points last season (25 goals, 39 assists) and 57 points (24 goals, 33 assists) in 2016-2017. "It's really humbling," Eichel said Wednesday. "Just to be in the consideration would be an honor. It's a huge honor. Obviously I've shown how invested I am in this city and I'm excited for the future." Kyle Okposo and Zach Bogosian were also named alternate captains for the team. "It was a difficult decision; we have a great leadership group," Coach Phil Housley said. "We believe Jack has made the right steps in his maturity. And we believe he's the right guy to lead the franchise." Eichel signed an eight-year, $80 million contract extension with Buffalo on Oct. 3, 2017, which begins this season. 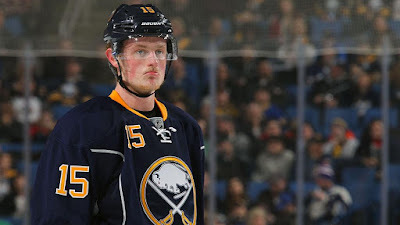 "With or without the contract, that was my goal coming into camp, to be a leader, to be a guy others could rely on and try to push our team and organization to the next level," Eichel said. "I want to be that person; I want to take on more responsibilities. Obviously when something like this happens, it maximizes that and you could be under more of a microscope. There are so many great leaders in that room and so many great people in this city and the organization, I just try to be myself and be the best player I can be everyday and be the best teammate." The Sabres finished in last place in the NHL this past season with 62 points (25-45-12) and hope to get off to a better start when they begin their season on Thursday against the Boston Bruins.